while our true homeland is Heaven, to which we must continually aspire. to try to come to terms with what no one could really understand. And God? God was a “dead word” in Alix’s way of thinking. Church was dry and meaningless and Alix felt that for her, it was unnecessary. Alix was interested in other things. She enjoyed the wide variety of cultural events that were available in Philadelphia. She found enjoyment in art, music, and the theater. She loved elegant dinner parties, beautiful clothing and the “good things” that money could buy. In her privileged upbringing, money could buy almost anything she wanted. After completing high school, Alix enrolled in the prestigious Briarcliff womens’ college in Westchester County, New York. There she met many women who, like her, were from wealthy families and who, like her, had been somewhat “spoiled” by an abundance of material advantages. As the scriptures note, “To everything there is a season, and a time for every purpose under Heaven.” (Ecclesiastes 3:1) The “season” for searching out the deeper meaning of life, came to Alix while attending Briarcliff College. Even though she did not believe in God, in some mysterious way, she was searching for Him. She began to spend a lot of time in the college library, reading books on world religions. The Eastern religions of India and Asia attracted her. However, in her study, she found that there were many doctrines in the teachings of Hinduism and Buddhism which she could not accept. Alix moved to Florence, Italy in her second year of college to study classical art. She had been accepted at the Simi Art Studio in Florence, which was considered to be one of the finest art schools in Italy. One of the students she met at the Studio was a wonderful and gifted man named Antonio Ciccone. Alix enjoyed his friendship and admired him for his remarkable artistic talent. Antonio, who had grown up in San Giovanni Rotondo, had experienced many hardships throughout his childhood. His father, a widower, was very poor and could barely provide for Antonio and the other children. Antonio tended sheep like many other young boys in the area. He loved to draw and sketch and it soon became obvious that he possessed an amazing artistic talent. Throughout Antonio’s youth, he had many opportunities to visit Padre Pio and to attend his Mass. 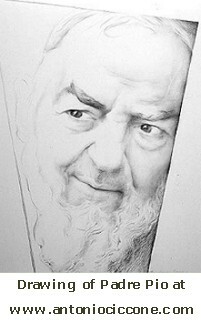 Antonio used to try to memorize the fine details of Padre Pio’s face in order to draw it. One time, Padre Pio turned Antonio out of the confessional because he realized that he had come primarily to study his face. Padre Pio had an aversion to being stared at and made it quite clear to Antonio. Padre Pio used to call Antonio, “Pitturi” (little painter) and he always had Antonio’s best interests at heart. He wanted him to lead an exemplary Christian life. Once, in the confessional, Padre Pio took both of Antonio’s hands in his own and held them for the duration of Antonio’s confession. “Please don’t disappoint me,” he said to Antonio. At one time, Antonio thought that he might have a vocation to the religious life and considered joining the Capuchin order. In clear and unmistakable words, Padre Pio said to Antonio, “No, you must paint. That is your path.” Years later, Antonio’s remarkably beautiful religious paintings would be placed in the Capuchin monastery of Our Lady of Grace as well as in Padre Pio’s hospital, the Home for the Relief of Suffering. A wonderful opportunity opened up for Antonio when a devout couple from Florence who knew Padre Pio, invited Antonio to live with them and study art in Florence. They had the financial means to provide for his education. Padre Pio was very happy about the arrangement and Antonio left for Florence with Padre Pio’s blessing. Alix Brown considered Antonio to be the most gifted student at the Simi Art Studio in Florence. He used to wear a Rosary around his neck, which always looked very striking to Alix. She admired him for his deep spirituality. Antonio told her many stories of his childhood, and of his experiences of knowing Padre Pio. He encouraged her to visit Padre Pio’s monastery in San Giovanni Rotondo. Because of the example of Antonio, as well as that of other devout Catholics that she had met in Florence, in her private and ongoing study of world religions, Alix decided to take a closer look at Christianity. The information that Antonio had shared with her about Padre Pio was very meaningful to her. She began to ponder the fact that Padre Pio was a Catholic and she had a desire to learn more about the teachings of the Catholic Church. Alix Brown’s study of Catholicism eventually led her to the decision to enter the Catholic Church, a plan that her family members were opposed to. Her parents would not give their permission and instead told her to delay her decision for two years, until she was twenty-one years old. Alix did what her parents asked of her. She waited patiently until her twenty-first birthday and was finally received into the Catholic church in 1961. After her conversion to Catholicism, Alix received an invitation from a good friend, Louise, to make a visit to San Giovanni Rotondo. Alix remembered the interesting conversations she had with Antonio Ciccone about Padre Pio and was happy to accept the invitation. It took thirteen hours for Alix and Louise to drive from Florence to San Giovanni Rotondo. It rained heavily for most of the trip. They felt fortunate to find lodging in the one and only hotel in the area. The town was rural and undeveloped and lacked many of the amenities that most people take for granted. For instance, there was very little hot water available in the hotel, something that Alix found surprising. The next morning, the girls got up very early in order to attend Padre Pio’s Mass. The “new” church where the Mass was said had been constructed in 1959, and was built right next door to the older one. San Giovanni Rotondo had outgrown the small but beautiful 16th century church of Our Lady of Grace. The new church was large and spacious compared to the original and could accommodate one thousand people. When Padre Pio was taken to see it for the first time, he spoke prophetically, “It is not big enough.” And it was true. Not estimating accurately the crowds that would be coming to San Giovanni Rotondo in the future, those who laid the plans did not make the church large enough. On many occasions, Mass had to be said in an outdoor portico, because the church could not contain the people. The local Italian people were territorial and aggressive when the church doors opened in the early morning. There was plenty of pushing, shoving, and elbowing that occurred as the people rushed forward to the sanctuary of the church. They obviously felt entitled to the best seats which were closest to the altar. Their conduct did not bother Alix. She had an understanding of the culture from her time spent living in Florence. Although it was noisy in the church as people hurried to find a seat, once the Mass started, the congregation became completely silent and all eyes were on Padre Pio. Padre Pio said the Mass slowly and prayerfully. One could sense his union with God. Deeply recollected, he seemed to become lost in the mystery of the Mass. A sense of the sacred pervaded the church. Alix was awed by the experience. Alix had decided that her trip to San Giovanni Rotondo would be an act of thanksgiving for her recent entry into the Catholic church. Yes, she had come to attend Padre Pio’s Mass, but she had also come to thank God for the great gift of faith that she had received and for the blessings of being Catholic. It was easy to pray in San Giovanni Rotondo. It was easy to think about God. The entire area, though poor and unimpressive outwardly, was pervaded with a sense of the supernatural. After Louise and Alix attended Padre Pio’s early morning Mass, Alix stayed inside the church to pray in silence. It was there that she received the incredible grace of a religious vocation. In an instant, and “deep down in her soul” Alix was suddenly and unmistakably aware that God was calling her to leave everything in the world, and become a religious. It was something she had never even considered as a possibility. She had never felt the slightest attraction to the life of a consecrated religious. She had thought at length about her future and was intending to pursue a career in art. For as long as she could remember, she had wanted to marry and raise a family. She assumed that her future husband would probably be Italian, since she loved living in Italy and planned to live there permanently. But in a flash, everything changed. Alix felt that she had been given an invitation by God to follow the path of the consecrated life. She knew what that meant. The strict vows of poverty, chastity, and obedience were nothing to take lightly. But she felt convinced that it was God’s will for her and she wanted to follow His will. She knew what a privilege it was to be called to such a vocation. As to which religious order to enter, she did not have the slightest idea. Each order had its own unique charism. There were the Franciscans, the Benedictines, the Cistercians, the Carmelites, and many more. There were missionary nuns, contemplative nuns, teaching nuns, and nursing nuns. She had a great desire to speak to Padre Pio about the matter. She hoped that he would advise her and direct her to a holy religious congregation. When it was time for Alix and Louise to go back to Florence, Alix knew for certain that she wanted to return again to the monastery of Our Lady of Grace. The visit had been a remarkable experience. She had been able to talk to a number of the residents in the area who shared many stories with her about Padre Pio. The miracles that surrounded his life and his extraordinary spiritual gifts were well known and well documented. They were of course, a part of his spirituality, but to Alix, they were not the most important part. 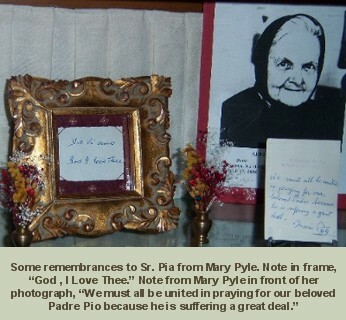 To her, the most significant feature of Padre Pio’s life centered on his all-consuming love for God and for the Church. After attending his early morning Mass, Alix came to the conclusion that his Mass was without a doubt, the greatest miracle of all. Alix returned each month to San Giovanni Rotondo for the next six months – sometimes for a few days and sometimes for weeks at a time. She did not mind the thirteen-hour journey from Florence. It was well worth every sacrifice and every inconvenience. 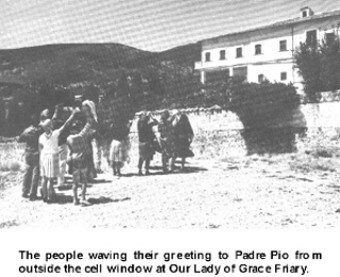 Through her many visits to San Giovanni Rotondo, Alix became acquainted with Padre Pio’s American secretary, Mary Pyle. Mary had become almost a legend in the town. Everyone either knew Mary or knew of her. People sought her out because she had worked tirelessly for Padre Pio and had faithfully assisted him for many years. Mary, who was born into a wealthy family in New York City, visited Padre Pio’s monastery for the first time in 1923. She was so impressed by attending his Mass and receiving his priestly blessing that she decided to move to San Giovanni Rotondo permanently. When Alix met Mary, she had been living just down the hill from the monastery for more than thirty-five years. Like many others, Alix had a great admiration for Mary and as time passed the two became close friends. Mary felt a special call, a special vocation to make Padre Pio known to others. Her workload was always heavy as she answered the letters that came into the monastery, baked the hosts that were used for Holy Communion, sewed the priestly vestments of the Capuchins, and greeted the pilgrims who visited San Giovanni Rotondo. Mary had many other duties, too numerous to mention. She was generous and kindhearted and always available to help anyone who needed assistance. Her charity and her many good works were an inspiration to Alix. Alix described Mary Pyle as having a “beautiful radiance” about her person. Mary would talk about Padre Pio for hours to the visitors who came to the monastery. She never tired of telling the same stories about Padre Pio, over and over again. Alix recognized Mary’s availability to the pilgrims and her willingness to share anecdotes and stories of Padre Pio’s life with them as an important “apostolic work.” Literally thousands of people were introduced to Padre Pio through the years because of Mary Pyle’s efforts. Mary wore the brown habit of the Third Order Franciscans. On one occasion, she sent one of her new habits over to the monastery to have Padre Pio bless it. However, whether he was jesting or not, for a reason that no one knew, he did not readily bless it but instead complained about it. Mary was told what had happened. “Did he finally bless my habit?” Mary asked. “Yes, he did. He made the sign of the cross over it,” the Capuchin replied. “Where was the habit when he blessed it?” Mary asked. “It was sitting on his lap,” the Capuchin answered. “Well, that is good enough for me!” Mary said and she was filled with gratitude. Mary treasured a word, a glance, a blessing from Padre Pio. Her dedication to him was total. Mary Pyle was advanced in years and was beginning to have numerous problems with her health when Alix met her. It became difficult for her to walk. After Mass, Alix used to take Mary’s arm and help her down the hill to her home just below the monastery. Mary had a little basket in her home that contained memorial cards with prayer requests for the deceased. Mary referred to the basket as a little “graveyard.” If any memorial cards came in, she asked Alix to be sure and put them with the others. Every day without exception, Mary faithfully prayed for the souls of all who had memorial cards in the basket. It was Mary’s habit, especially in her later years, to take a nap every afternoon after her midday meal. Alix used to help her up the stairs to her small bedroom on the second floor of her home. It took a great effort for Mary to get up the stairs. She often asked Alix to read to her until she fell asleep. Because Mary had led an intensely active life, it was very difficult for her to accept her declining health. After Alix moved back to the United States, Mary had a stroke. She wrote several letters to Alix and asked for her prayers so that she would be able to accept her condition and surrender completely to God’s will. Alix knew how fortunate she was to be able to spend so much time in San Giovanni Rotondo, meeting the Capuchins, the pilgrims, and great souls like Mary Pyle, as well as others who had dedicated their lives to assisting Padre Pio’s work. To Alix, San Giovanni Rotondo, from an architectural and artistic standpoint, was a town that was greatly lacking in style and beauty. It did not have the old world charm of places like Pietrelcina, Assisi, or Perugia, with their cobblestone streets, interesting structures, quaint buildings, and beautiful churches. While the architectural style may have left much to be desired, Alix nevertheless felt inspired by the geography of the area. The wide-open expanses, the rocky, barren hills, heavy rains in the autumn and winter, the strong winds that often howled and whipped down the Gargano mountain, the cold, bright stars that filled the early morning sky – this was San Giovanni Rotondo. To Alix, there was a mystical feeling to the landscape and the terrain. And most important of all, Padre Pio lived there. Alix was also aware of the invisible forces that were at work in San Giovanni Rotondo, the age-old battle of good versus evil. Although it was not something that she could see with her eyes, she could sense it and feel it. One recalls that Padre Pio had a vision when he was fifteen years old, of that very battle of good verses evil which takes place within the human soul. His vision was a revelation of the spiritual warfare that he would encounter throughout his life. In the vision, the young Padre Pio (Francesco Forgione) suddenly saw a majestic and beautiful figure standing beside him. The man had a radiant countenance, similar to the brightness of the sun. He said to Francesco, “I am here to tell you that you are going to have to fight like a courageous warrior.” The resplendent figure took Francesco by the hand and led him to an open field. In the field stood two large groups of men. One group had beautiful and shining faces. They were wearing robes of the purest white. The other group was dressed in black garments. They were ugly and frightening in appearance. Shortly after, Francesco had another vision and was given the realization that the beautiful and resplendent man who had stood beside him in the vision was Jesus. In truth, it was Jesus who was always with him, assisting him in the many trials and tribulations of his life. In his fight against evil forces and in his life-long battle against demons, Padre Pio would always remain close to God and would be victorious. If the demons attacked Padre Pio at times, the angels were always nearby to shield and protect him. The angelic realm was very real and very much alive to Padre Pio. Whenever he spoke about angels, he spoke from his own direct experience. He had been able to see and communicate with angels from his childhood. Monte Sant Angelo, the beautiful shrine dedicated to St. Michael the Archangel, was located approximately twenty-five miles from San Giovanni Rotondo. Padre Pio, who had a life-long devotion to St. Michael, had made a pilgrimage there in his youth. He often encouraged people to visit the shrine. On one occasion, Alix was invited to go with a group of friends to Monte Sant Angelo. They intended to make the pilgrimage on foot, as an act of penance and sacrifice. 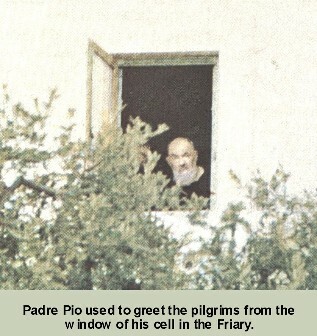 In the confessional, Alix told Padre Pio about her plan to visit the shrine and asked him for his blessing on the trip. Padre Pio made no reply. Thinking that he might not have heard her, Alix repeated her request, this time even louder. Once again, there was no response. As it turned out, on the day of the pilgrimage, Alix became ill and could not go with her friends. Most likely, Padre Pio had known that she would not be able to go on the pilgrimage and so had not given his priestly blessing. Alix went to confession numerous times to Padre Pio. In the confessional, before Alix could name her sins, Padre Pio often began by asking her a number of direct questions regarding those very sins. “Have you told the truth?” he would say. “Have you exaggerated?” he would inquire. While many people do not consider exaggeration to be a matter of consequence, Padre Pio obviously did. It was something that needed to be addressed and corrected. He was particular and exacting to the smallest detail. Other than a few simple questions that he might ask, Padre Pio usually said very little in the confessional. If he was asked a question directly, he often answered by a simple “yes” or “no.” Although confessions to Padre Pio were generally short, they were extremely beneficial, as so many people testified. Padre Pio was concerned with the soul and how that soul could be saved. Everything else was secondary. “Trust in God and pray,” were his frequent words. There were always long lines of people waiting to make their confession to him and there was simply no time for discussions or extended conversations. Alix investigated many different religious orders in an effort to find one that would be suitable for her. As Padre Pio advised her, she spent many hours in prayer, invoking God’s intercession. When she read a biography of St. Teresa of Avila, she felt drawn to the Carmelite spirituality. 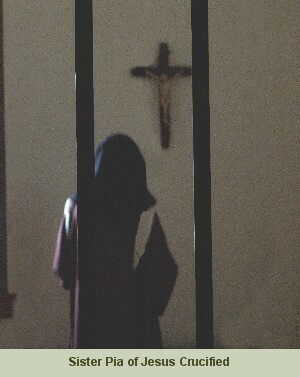 She visited a cloistered Carmelite congregation on the East Coast to inquire about their way of life. The moment she walked through the door, it felt like home. She was accepted into the congregation. Since she chose an enclosed order, there would be no going out into the world, no traveling about. She did not think it would be a difficult adjustment. For Alix, the greatest difficulty that she faced was leaving Padre Pio, knowing that she would never see him again. Before joining the Carmelites, Alix wanted to visit Padre Pio one last time. In 1963, Alix spent four months in San Giovanni Rotondo. She attended Padre Pio’s early Mass every morning and then spent the greater part of the day in church. At 11:30 a.m. each day, Padre Pio went to the balcony of the church for his private recitation of the Rosary. Most of the pilgrims who visited the monastery were not aware that he did this. Because Alix had spent so much time in San Giovanni Rotondo, she was very familiar with his daily routine. She made sure that she too was in the church at 11:30 a.m. each day to pray her Rosary and to unite her own prayers with Padre Pio’s. It was always a consolation for her to look up into the balcony and see Padre Pio deeply engrossed in prayer. She felt that she benefitted just by being near him. When Padre Pio finished praying his morning Rosary, he would walk across the upper balcony of the church and through a connecting door into the old church. There he would recite the Angelus, the beautiful prayer to the angel of God, with all who were gathered. Afterward, he would bless the crowd. Daily, Alix recited the Angelus with Padre Pio, and then received his blessing. Alix attended Benediction every afternoon in the church, with Padre Pio presiding. It was truly a blessed experience. The way Padre Pio held the monstrance for Benediction was something that Alix had never seen before. He was so aware of the true presence of Jesus in the Blessed Sacrament that he held in his hands. His face was radiant during the Benediction. Mary Pyle played the organ and directed the choir which sang at Benediction every afternoon. In the evening before retiring, Alix joined the local people who stood at Padre Pio’s window and sang their goodnight songs to him. Buona Notte, Padre Pio (Good night, Padre Pio) was one of the favorites. Alix entered in the cloistered Carmelite convent in June 1964. After six months as a postulant, she became a novice and took the religious habit. At that time, she was invited to choose a new name. The Carmelite tradition allows the novice to choose two names – a first name and a religious title to follow. For her, the decision was easy. Her new name became Sister Pia of Jesus Crucified. She wanted to stay as close to Padre Pio as she could. Taking his name would be a constant reminder of him. Padre Pio wanted people to make a good preparation before receiving Holy Communion and a thoughtful and prayerful thanksgiving afterward. “The thanksgiving after Mass is something that must never be neglected,” he once said. His own thanksgiving after Mass lasted at least forty-five minutes. Padre Pio strictly observed the fasting rules of the Church before receiving Holy Communion and he insisted that everyone else do the same. He wanted people to dress modestly in the house of God. He was accused of being old-fashioned and unbending in this regard, but he would not compromise. People would not be admitted inside the church if they were not dressed modestly. There were to be no conversations, no talking for any reason, once inside the church. Instead, a strict silence was to be observed. God was very near; it was a time to put everything else aside but the thought of God. These considerations are especially important for the times we live in today, when many beautiful and devotional Catholic practices and traditions have been long-since abandoned. Sadly to say, many people have lost a great treasure – a spirit and an attitude of reverence and a sense of the sacred. But in truth, what has been lost can be reclaimed. Let us hope and pray for this intention. Throughout her many years as a Carmelite nun, Sister Pia has frequently gone back in time to those early days, when she visited Padre Pio in San Giovanni Rotondo. Nothing had been a coincidence. It had all been a God-incidence, leading her step by step to the place where she belonged. Sister Pia has pondered the fact that she received the grace of a religious vocation, not in Florence where she had studied art, or in New York where she attended college, or in Philadelphia where she had grown up, but on a visit to San Giovanni Rotondo, that small and remote town in southern Italy that seemed so very ordinary and unimpressive and lacking in so many ways. There, in the church of Our Lady of Grace, where Padre Pio had said daily Mass for most of his priestly life, where he had spent countless hours in prayer and in hearing confessions, she received the call to offer her life totally to God and to dedicate herself to prayer and reparation, and live hidden from the world. In 1965, Padre Pio sent a message to Sister Pia through his assistant, Padre Pellegrino Funicelli. The message said, “Tell Sister Pia to keep herself burning ardently like a little lamp before Jesus in the Blessed Sacrament.” That is exactly what Sister Pia has been doing for these many years. Let your desire be to see God; your fear that you may lose Him; your sorrow that you are not having fruition of Him; your joy that He can bring you to Himself. Thus you will live in great peace.